When it comes of elections, candidates usually get most of the attention. However, besides picking their leaders, Arkansas voters also get to make their own laws via ballot issues. Ballot issues are proposed laws and constitutional amendments that voters decide, collectively, to adopt or reject. In Arkansas, ballot issues can be referred to the people by the legislature or by a petition drive. As of this writing, five ballot issues are slated to be voted on this November. To the best of our ability, we have summarized the proposed ballot issues to give voters as clear a picture as possible of what each proposal would do, if passed. All printed copies of the Arkansas Voter’s Guide include a copy of these summaries (order your printed guides here or call our office at 501-375-7000). If you have any questions about the ballot issues or the summaries below, feel free to call our office at (501) 375-7000. ISSUE NO. 1: (SJR 7) A Proposed State Constitutional Amendment Concerning Review and Approval of Administrative Rules. 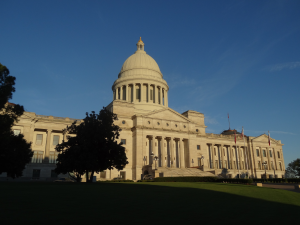 Our Summary: This proposed amendment would require all administrative rules promulgated by state agencies to be approved by a legislative committee of the Arkansas General Assembly. ISSUE NO. 2: (SJR 16) A Proposed State Constitutional Amendment Concerning Initiative and Referendum and Providing Certain Requirements for the Correction or Amendment of Insufficient State-Wide Petitions. Note: The initiative and referendum process in Arkansas is very complicated. This proposed constitutional amendment deals with portions of the process that many may fail to fully understand. We urge individuals to study Issue 2 thoroughly before casting a vote. Our Summary: This amendment would increase the requirements for sponsors of petition drives to place measures on the ballot. It would give the Secretary of State additional power to keep measures from being placed on the ballot for a vote. Currently, the Arkansas Constitution provides that an issue may be placed on the ballot for a vote of the people with submission of a petition signed by 10% of voters, based on the total number of votes cast in the most recent race for governor. Under current law, if the Secretary of State checks the petitions and finds that not enough signatures are valid, the sponsors have an additional 30 days to obtain more signatures. This amendment adds additional requirements necessary for petition sponsors to qualify for the extra 30 days to gather signatures. Under Issue 2, sponsors of ballot measures would not be granted the extra 30 days if the Secretary of State rules so many of their signatures invalid that they do not have at least 75% of the total number of signatures required by the state. The same would apply to the 15 counties each petition drive must “validate”. Under current law, of the total number of signatures petition sponsors obtain statewide, a certain number must come from each of at least 15 different counties. This is intended to prevent voters in one heavily-populated county from singlehandedly placing an issue on a statewide ballot. Currently, if the sponsors fall short in any county, they can receive 30 additional days to gather more signatures. Under Issue 2, sponsors of ballot measures would not be granted the extra 30 days to gather petition signatures if the Secretary of State rules so many of their signatures invalid that they do not have at least 75% of the total number of signatures required in any one of the 15 counties. In either case, the Secretary of State would disqualify the petitions, and the measure would not be placed on the ballot. Our Summary: This proposed amendment would increase the number of years a person can serve in the Arkansas General Assembly. It would allow individuals to serve up to 16 years in the Arkansas General Assembly. This includes time in the Arkansas House and Senate combined or in only one chamber. Arkansas’ current term limits law allows elected officials to serve up to 6 years in the Arkansas House and up to 8 years in the Arkansas Senate. In addition, Arkansas’ current term limits law allows individuals to serve another 8 years in office in each of the constitutional offices like Governor or Attorney General. This proposed amendment makes no changes to that part of the law, nor does it limit the terms of judges. Under this proposed amendment, members of the General Assembly would be prohibited from registering as a lobbyist until 2 years after their term expires. This proposed amendment would not allow direct corporate gifts to candidates. It would allow candidates to receive gifts from political action committees, political parties, and individuals. It allows corporations and labor unions to give to political action committees. This amendment prohibits gifts to elected officials from lobbyists or anyone employing a lobbyist, or a person acting on behalf of a lobbyist. It allows lobbyists to make campaign contributions to candidates and it makes exception to allow for food or drinks paid for by lobbyists at planned events where any government body is invited. This amendment would prohibit the General Assembly from setting their own salaries, and it would prohibit them from setting the salaries of judges and constitutional officers. Instead, salaries would be set by a seven-member “independent citizens commission” appointed by the Governor, President Pro Tempore of the Senate, Speaker of the House, and Chief Justice of the Arkansas Supreme Court. Commissioners serve a four-year term, and no commissioner may serve more than two terms. Our Summary: This proposed State Constitutional Amendment would make the sale, manufacture, and distribution of alcoholic beverages legal in every county in Arkansas. Under current law, the citizens of any county can circulate petitions and vote to allow or not allow the sale of alcohol. Thirty-seven of Arkansas’ 75 counties have voted to prohibit the sale of alcohol. This proposed amendment would require those “dry” counties to allow the sale of alcohol. It would also prevent the citizens of any county from ever voting to ban the sale of alcohol in their county or local community. Our Summary: This proposed Act would incrementally raise Arkansas’ minimum wage from $6.25 per hour to $7.50 per hour on January 1, 2015; to $8.00 per hour on January 1, 2016; and to $8.50 per hour on January 1, 2017.